The domestic cat life can be pretty boring if you think about it. They spend all day within the confines of your home so it’s really up to you (the human) to liven it up for them! Today, I’ll share my best tips on activities and toys for bored cats. This post full of bored cat solutions is going to make your job as “cat entertainer” a whole lot easier. Bonus points because they’re from an eco-friendly, zero-waste perspective 🙂 and if you’re into the whole “saving the planet” idea, check out my post on living zero waste with a cat! I live in a 500 square foot apartment with no balcony or outdoor area. I’m on a relatively busy street so if I try to open the windows for my 2 cats, they get scared and hide whenever a large truck passes by. So, I’ve spent a lot of time figuring out how to make my cats’ lives more exciting. If you’re trying to figure out how to entertain a bored cat at home, you can start by considering some updates to your interior decor. There’s this AMAZING ripple rug that you can adjust to build new forts and tunnels for your cat(s) on a daily basis. Made from 100% recycled plastic bottles, it’s also an environmentally responsible option as it’s not using any new virgin petroleum to make. Cats love it because they can roll around in it, crawl thru the tunnels, and scratch in peace without a human yelling at them to not scratch the carpet! What’s probably the best feature is that it’s machine washable. I absolutely hate cat things that I can’t wash because once it’s covered in cat hair or there’s been an accidental hairball, it pretty gross to just “spot clean”. If you don’t have space in your home for a ripple rug, consider this paper bag tunnel as another eco-friendly alternative. Cats LOVE playing in and around paper bags and cardboard boxes for some strange reason. The benefit is that you can fold this away easily and it’s biodegradable when you need to dispose of it. The drawback is that because it’s made of paper, while it is more durable than a normal paper shopping bag, it will still rip if your cats play roughly. The outside world is pretty exciting for a cat because there’s constant moving. They get SO excited when they see a bird or a butterfly, but those don’t come that often. Stack the odds and stick a bird feeder to your window. You’ll provide birds with a delicious, nutritious snack. And you’ll give your cats the most exciting show. However, be prepared for some vocal cats whenever they see a bird. I have one similar to this that (luckily) I got from my local Buy Nothing Community. Don’t forget the bird food – don’t feed birds bread or your leftovers – it’s bad for them! Feed them nutritious seeds or mealworms. You have your bird feeder all set up, now all they need is the best seat in the house. Give them a height boost via a good cat tree. There are so many options available that you should find the perfect cat tree for every kind of cat. You can even find these amazing window loungers. They stick to the windows via suction cups and are actually really sturdy, even for my really heavy cats. While the first 2 weeks with the new cat was pretty stressful, they’re now best of friends. If you can’t get another cat, maybe you can mimic the way cats groom and show affection to each other with this cool tool. LOL! 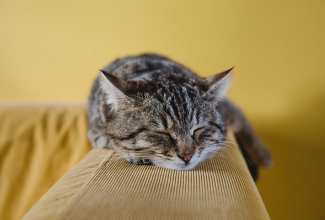 Here are some product ideas for how to deal with a bored cat – tips that are both active (where you’re involved) and passive (where you’re not involved – because there’s only so much time you can play Da Bird with your cat, no matter how much he loves it)! I have an uncertain relationship with the laser light. On the one hand, my cat LOVES it. On the other hand, I’ve read warning articles that it’s incredibly frustrating for a cat to not be able to “catch” anything. This laser light toy is a good eco-friendly option since it is rechargeable in 10 minutes with a USB. Saves batteries from going to landfills and saves money from not having to buy batteries. As I mentioned before, Da Bird is seriously one of my cat’s favorite toys. The feather gets quite tattered after a few months because my cat is pretty intense, so it might be better to invest in a few birds right from the start if yours is the same. My cat also loves his ribbon. Something about sliding it thru the bedsheets, under the door, or along the carpet really activates his predatory pouncing instincts. I use the ribbon from an old gift basket. It’s all tattered from my cat’s nails by now but he still loves it. Before that, I’ve also cut strips off old rags and knotted them together. Get something around 2 feet and you’re good to go. If you don’t have any spare material lying around, you can buy a really great, low-priced one here. Combine the best of both the laser light and the stringy toys with this awesome auto-rotating chaser toy. With a rechargeable base, you’ll entertain your cat AND be eco-friendly – recycling those batteries are tedious, and buying new ones can get expensive! Before you leave the house, leave a few of these super simple crinkle balls lying around. Cats love swatting these around. Those looking to avoid plastic can try these soft and fuzzy wool felt balls! These are definitely the best toys to keep indoor cats entertained. I hope this post has given you some good ideas for how to entertain your cat. The biggest priority is giving your cats a happy life. But if we can combine it with eco-friendly solutions that are good for the planet, that’s even better! PreviousPrevious post: Are Essential Oils Sustainable and Good For The Planet?